A voter referendum to stop I77 tolls? The answer to that question is a solid maybe – if the stars align correctly, the Legislature moves quickly, and voters decide that's what they would want in the face of what would surely be massive pressure to the contrary. With all those qualifiers “solid” probably is not the correct way to describe the possibility of averting HOT lanes on Interstate 77, but at least it is a possibility that’s on the table with a bill recently submitted by NC Senator, Jeff Tarte (R-Mecklenburg) of Cornelius. Well, that possibility does not sit well with Senator Tarte, in an email response to questions for this story Tarte had this to say about the projects included in the bond proposal. As for the likelihood the bond package makes it to the ballot Tarte had this to say. With that as the backdrop, in late March Senator Tarte introduced Senate Bill 639 titled the “Transportation Funding Bill”. While this bill is primarily a revenue bill proposing tax and fee increases to generate more transportation infrastructure dollars, it also includes an interesting provision requiring a local referendum prior to implementing any new toll roads. The preliminary effective date of the bill is August 1st 2015 – a date Tarte confirmed was chosen to include the I77 HOT lanes project. So, what could happen – emphasis on could – with this proposal relative to the HOT lanes project? After assuming the Legislature moves with jackrabbit speed to pass a complex and controversial set of new tax increases prior to recessing this summer and assuming the bill’s referendum provision survives the editing process, then you have to assume the public would even vote to stop the project for this bill to have any effect on the project. With as much negative press as this project has received, you would likely think that a referendum shooting it down would be a no-brainier. However, historh and the setup of the referendum proposal itself would say otherwise. We have seen this movie before here in Mecklenburg with the transit tax repeal effort in 2007. In that effort, the special interests which benefited from the tax poured whatever it took into an the effort to defeat its repeal via referendum. The same thing would surely happen here if there was a referendum on HOT lanes. In the case of the I77 project, local transportation officials have already approved how the “bonus allocation” that came with accepting tolls will be spent. You can hear the ads now supporting tolls - ads funded by contributions from those who will build the road or benefit from its operations. Add to that the fact that Tarte’s proposed legislation does not require any certain course of action in the event a project fails in a referendum. What happens then? If the answer is simply the road doesn't get built and the next project in line gets those dollars, why would most people not vote for tolls under those circumstances? Of course, that would be setting up the referendum as a false all or nothing choice. For the I77 project, that would be close to $300 million including the bonus allocation as well as the other funds the state has committed for the project in the contract with Cintra. That would be enough to make some serious improvements to the corridor without resorting to tolls. Then again, presenting it that way would also expose that we never needed to resort to tolls in the first place, and that's not something those who have supported the project are likely to admit. This column spends a lot of time looking at ways to improve our local government, and sometimes that can come off as being a bit “negative”. So, periodically it's nice to talk about the good things people are doing in the community. This last week saw two emails land in the inbox that are excellent reminders of that. A few short months ago during Christmas week, this column told you about the Room In The Inn (RITI) program run by Urban Ministries in Charlotte where local church congregations and other organizations provide a warm place to sleep for our homeless neighbors during the winter months. In Huntersville, Cornelius, and Davidson 15 different congregations participate. As of March 31st, this year’s RITI program has come to an end, so I wanted to pass along an update and some numbers. Over the course of the 2014/2015 Winter, RITI provided almost the exact same number of bed nights, as it did last year – just over 17,000. The number of families needing shelter and the total number of children actually increased slightly this winter. The overall number of organizations participating stayed exactly the same at 135. The good news here is that because of this program and the thousands of volunteers who helped make it a success, that was 17,000 nights people were spared from the cold. Please keep this effort in mind next year is you are looking for a worthwhile cause that can make a real difference. While the RITI effort was winding down, the other effort I’ll mention is just getting ramped up. It is an opportunity where people can really get into the weeds – pun intended – while helping others. That opportunity would be the annual start of the Davidson Community Garden on Potts Street in Davidson behind the Wells Fargo drive through. The garden is on land donated by Davidson College with its unofficial kickoff each year being a work day as part of the annual “Great Day of Service” put on by Davidson United Methodist Church. This year that was on March 14th. Five years ago, the initial garden was build during the DUMC event, and it has been added to every year. The second summer saw the garden double in size. For the third summer, the garden set the goal of donating a full ton of food to the Loaves and Fishes food pantry at the Ada Jenkins Center. That goal was met and has been repeated annually since then. After three summers of watering using a 300 foot hose and crossing the railroad tracks, a fundraiser brought in more than enough money needed to install a permanent water supply going into season number four. Along the way the garden has brought together people from all across the community. On any given Saturday, you will see residents from neighborhoods all across town. Families, students from the college, seniors and young children can all be seen working together. There are a number of groups that participate regularly such as different Scout Troops and classes from the Community School of Davidson. There is also one group that likely never sees the fruits of their labor – local inmates. Many of the plants that are grown in the garden get their start in the greenhouse of the North Mecklenburg Jail in Charlotte as part of a work training program. The whole operation is coordinated by Connie and Eddie Beach of Davidson. For their efforts, they were honored last November with the town’s annual “Jack Burney Award” for community service. So, if you are interested in learning how potatoes are harvested, stop by in early June. You may get to see what a hundred pounds of potatoes coming out of the ground looks like. Or, if you've ever wondered where that odd looking southern staple, okra, comes from, then check out the tall bushy plants that seem to be growing just fine in the blistering heat of July and August. The okra plant is from Africa, and it takes off when most other things start to wither. Unlike most “community gardens” there are no fees or individual plots. The Davidson Community Garden donates the bulk of the produce to the Loaves and Fishes food pantry at the Ada Jenkins Center. It’s truly a garden for the community. However, even though you won't have your own personal plot at this garden, there is a good side benefit to volunteering. After a good morning’s work, you might just get to take home one of those juicy tomatoes. Garden volunteers meet Saturday mornings at about 10am through the fall. Time to (re)appoint? Davidson's town attorney? A few weeks ago Davidson’s Town Manager, Leamon Brice, announced his intent to retire later this year after 25 years of service to the town. Twenty five years is a long time. However, there is another official who works for Davidson who has a much longer tenure. That would be Davidson’s Town Attorney, Rick Kline. Kline has been in that position nearly 39 years. Like the town manager, the town attorney actually actually works “at the pleasure of the Board” – meaning this position reports to the Board – not the town manager as some may think. By statute, the position of town attorney is appointed and does not have to be reappointed after each election. Appointments by a previous board are considered to be continuous – unless revoked. That makes a lot of sense when the attorney is also a town employee. For example, Mooresville's town attorney is full-time. Cornelius’s town attorney actually serves in that role for both Cornelius and Belmont. These town attorneys do not operate in a private practice, so it doesn't necessarily make sense to re-appoint in that situation. However, that is not the case in Davidson. Like in many other small towns Davidson’s town attorney is also a private attorney appointed to handle the Board’s legal questions. That means the attorney for the Town of Davidson also operates in private practice. In Mr Kline's case, he is an active real-estate attorney. Recently, this arrangement has resulted in a a couple of eyebrow raising situations. Readers may remember late last year a story regarding the Bradford neighborhood in Davidson. At the public hearings for the town’s proposed planning ordinance re-write, Bradford’s HOA President delivered some lengthy remarks regarding long-running issues with the town and the developer – including direct reference to the town attorney wearing multiple hats while also serving as the developer’s private attorney. In the interest of transparency, readers should know I am a Bradford resident and former president of the HOA myself, so I am intimately familiar with some of the concerns the neighborhood has with this setup. In response to follow-up questions after these hearings, the Town Manager responded about Kline's dual roles. 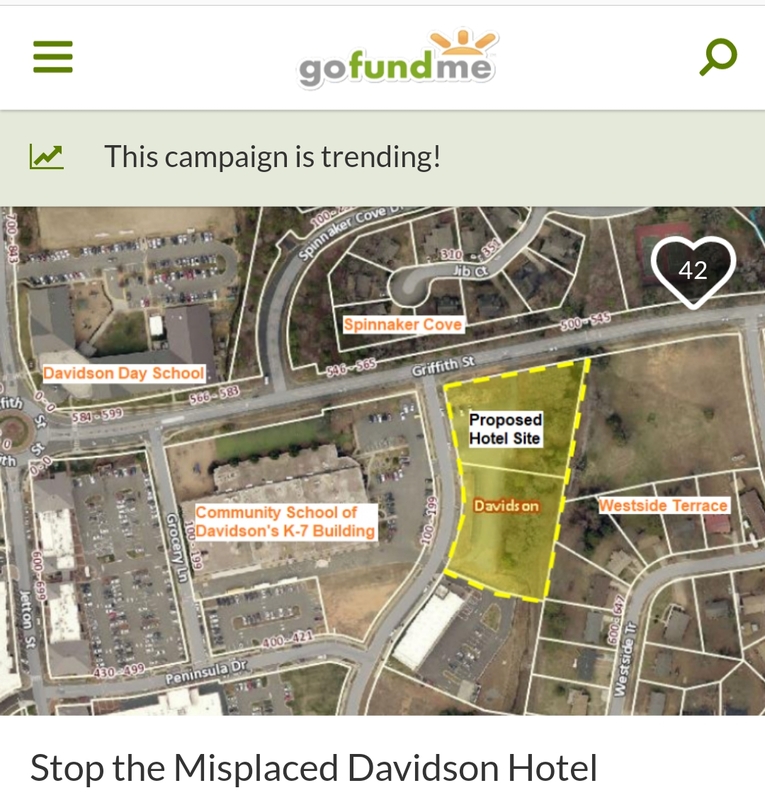 After indicating that Kline had always communicated to the developer that he could not be involved with issues related to the town, he went on to say the Davidson Board had asked Kline to contact the State Bar for an opinion on the “propriety of his representation” of both the developer and the town. That was at the beginning of last month. As of this writing, the Board still has not heard the results of that request. Making the results of this request public is being left up to Kline. In another ongoing matter, the town attorney once again sits the middle of an uncomfortably close situation. At the end of the February Board meeting, Commissioner Stacey Anderson asked about some proposed new lots in the River Run neighborhood being offered by the River Run Country Club. Mr Kline has long served as an attorney for the overall River Run developer – an entity called River Run Limited Partnership. He is also a long-time member of the country club which is the totally separate entity trying to sell the lots. Multiple records requests show that there has been considerable discussion about the buildability of the lots due to floodplain and other issues with Mr Kline sometimes acting on behalf of the town in a roll more suitable to the Planning Department than the town attorney. The Town’s position is to not want building in the floodplain, but to say the least, having someone involved with this many apparent competing interests while representing the town certainly muddies the waters. So, why bring up these issues now? First, the Town Board is beginning next year’s budget process. If the Board was to decide to make a change, now is the time to do it. Furthermore, with the above issues continuing to play out over the coming months, it would be good if the Board took steps to clarify its support (or lack thereof) for the status quo. • Officially reappoint Mr Kline as a vote of confidence. While not required by law, according to the UNC School of Government it is something that certainly can be done. • The Board could decide it is finally time to remove even the appearance of any conflicts of interest and begin the process of looking for a new town attorney. Unfortunately, when the status quo brings this many headaches along with it. Doing nothing, is not really an option at all. This story first appeared in the Herald Weekly.